HCPro had ICV producing a live certification training course from New York City. We have a regular schedule with HCPro to produce these courses at different host venues around the country. Live webcasting of Hospital and medical services subject matter training for certification and CME credit. All managed within our Media Portal. HCPro is able to sell and manage license groups, schedule and launch events, manage on-demand access to the streaming videos or testing content and more. Call 925-426-8230 to see how your training can be sold to a wider audience. ICV had crews in Budapest Hungary for the International Pharma Congress. Live HD webcast and Media Portal for on-demand archive streaming video sales. Live webcast access was sold through the use of our Media Portal. ICV manages all e-commerce and content management for the client when we use our Media Portal for a Live Webcast. 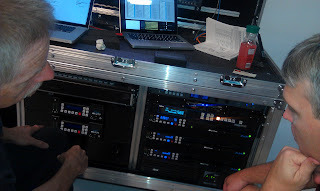 We bring all the Production gear, and all of the encoding equipment needed for streaming a live webcast. ICV will coordinate with the venue management and your event organizers to streamline the entire event. 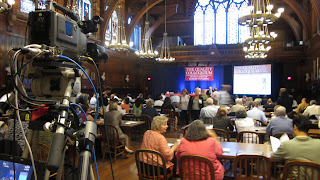 Live webcastingthe Quality Colloquium in Cambridge for the 6 the year in a row. Huge event at historic Annenberg at Harvard, which ICV produces. We produce the live webcast, and post on demand archive video into a custom Media Portal designed and built by ICV for he client. The Media Portal allows social integration and after the event profits by selling on demand access to streaming video content. This creates an opportunity that many event promoters miss; monetizing the content after the event. great video content is great video content. If you have it, it can be very valuable. Many of our clients have no idea how to take advantage of that. Where do I put my archive video of events or conference or e-learning? How do I post it to the web? How do I sell access to the video content? Often this is a value to the public for years to come. ICV has crews in Germany shooting e-learning content for Oracle. We have multiple classrooms running daily. We shoot HD video, edit in Final cut on the spot and publish to the web into a Leraning Management System (LMS). Our Panasonic HD cameras and KiPro recorders are running daily and they are working great. We have more of them available for rental. We shoot all over the world for this great client. We have developed a production, scheduling and post-production process specific to this long-term project. We save the client time, and deliver a far superior product that they are able to monitize. Value and client interest has soared thanks to a collaboration between Oracles experts and ICV's video production experience. Call us to learn how we can build online assets and learning for you. Been really busy. Live webcasting, building Video Streaming Portals for our clients. Just lots of Live Webcasting events this spring and summer. We have also been busy here at home building out our custom Live Webcasting and Live Switch Video Flypack Rental systems. Designed with video producers in mind, we have spent months choosing the equipment for these racks. ICV enlisted the help of the experts in video system integration at Advanced Systems Group. Everything has been carefully crafted to be flexible, simple to hookup and dead reliable. Stroll in, plug in and roll in to your HD Production with these Video Flypacks from ICV.